A new Northwestern Medicine study published in The BMJ provides the most extensive assessment of outpatient antibiotic prescriptions to date, and demonstrates the scale of inappropriate antibiotic prescribing in the U.S. Using a novel classification scheme, the investigators determined that only 13 percent of outpatient antibiotic prescriptions were appropriate, with 36 percent considered potentially appropriate. 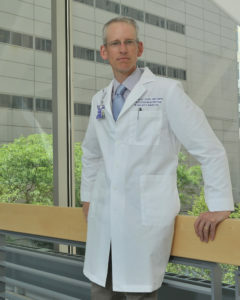 Jeffrey Linder, ’97 MD, MPH, chief of General Internal Medicine and Geriatrics in the Department of Medicine and the Michael A. Gertz Professor of Medicine, was a co-author. Jeffrey Linder, ’97 MD, MPH, chief of General Internal Medicine and Geriatrics in the Department of Medicine and the Michael A. Gertz Professor of Medicine, was a co-author of the study published in The BMJ. The study is uniquely comprehensive: For the first time, the investigators evaluated all 91,738 diagnosis codes in ICD-10 (the system used in the U.S. to code diagnoses) and categorized each for antibiotic appropriateness. They also examined all outpatient antibiotic prescriptions among a cohort of 19.2 million patients, irrespective of the reason or site of care. Overuse of antibiotics contributes to the development of antibiotic resistance — a major public health concern — increases healthcare costs, and exposes patients to unnecessary side effects. In the current study, the investigators developed a new, comprehensive ICD-10-based classification scheme that determined whether each of the more than 90,000 diagnosis codes “always,” “sometimes,” or “never” justified treatment with antibiotics. “This means that our prior methods of looking at antibiotic prescribing based on location or specific diagnosis code is missing a huge proportion of antibiotics,” Linder explained. Beyond highlighting the widespread overuse of antibiotics in the U.S., the study could also help facilitate future research; the authors note that the new classification scheme could be applied to any dataset using ICD-10 codes, providing a valuable tool for investigators. Linder continues to lead large studies into the overuse of antibiotics. Most recently, Linder and collaborators at the University of Southern California launched a five-year study to examine antibiotic prescribing practices in telemedicine. The study is supported by the Health and Human Services Department’s Agency for Healthcare Research and Quality. The BMJ study was supported by a grant from the Agency for Healthcare Research and Quality (R01HS024930), and a contract from the Agency for Healthcare Research and Quality (HHSP233201500020I).